New York Rangers goalie Henrik Lundqvist makes a save against the Detroit Red Wings. 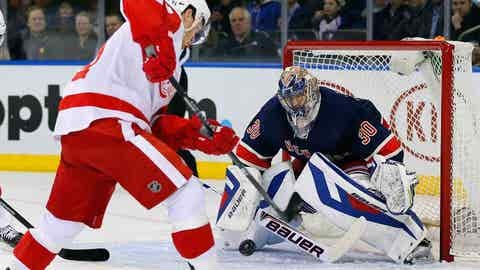 NEW YORK (AP) — The only shot the New York Rangers put past Detroit’s Jimmy Howard was actually meant to be a pass. Mats Zuccarello had no complaints when the puck found its way into the net. Zuccarello broke up a scoreless duel between two Olympic goalies with 5:58 remaining, lifting the Rangers to a 1-0 victory over the Red Wings on Thursday night. "It was a pass to (Benoit) Pouliot," Zuccarello said. "It was a lucky bounce, I guess. I will take that." Zuccarello floated a puck over Howard when he drove to the net, putting New York’s 45th shot of the night into the net. Howard recognized Zuccarello’s intention, he just couldn’t stop it. "Bittersweet," Howard said of his 47-save performance. "Zuccarello wasn’t looking to shoot that. He was looking to pass it across. It’s unfortunate." It was just enough offense for Henrik Lundqvist to earn his third shutout of the season and 48th in his NHL career. Lundqvist, who made his sixth straight start, stopped 38 shots. Gustav Nyquist slipped a shot behind him with 44.5 seconds remaining, but Lundqvist reached back and covered the puck just in time. "You kind of wait for a reaction when you hear it hits the post, but then you don’t get a reaction, so you know it’s behind you somewhere," Lundqvist said. "You don’t want to make too big of a move, so I just turned around, and it was right there. It’s fun when you get some puck luck. Maybe I earned it after a few tough bounces." The Red Wings were beaten 1-0 for the second straight game. Detroit, which hasn’t scored a power-play goal in six games in 2014, lost at Anaheim on Sunday. "It’s frustrating right now," Howard said. "We have to score more goals. We are creating a lot of chances, we just can’t bear down and get them in right now. "It was fun. It was like the playoffs. But it’s a lot more fun to be on the winning side." The Rangers bounced back from a 2-1 loss to Tampa Bay on Tuesday and completed a 3-1 homestand. New York is 9-3-1 in its last 13 games. "This was important for us, to come back right away with a win and a strong effort," Lundqvist said. The second period played out much like the first with Lundqvist of Sweden, and American goalie Howard staring each other down at opposite ends of the rink. "I think we both felt that the next mistake is going to be the difference. And it was," Lundqvist said. "Lately, we just believe in our system and we play a really strong team game. It’s been paying off lately in big games." Howard was the busier of the two, stopping 17 shots in the second after making 18 saves in the first. Lundqvist followed up his 15-save effort of the first by turning aside 10 shots in the second. As good as Howard was, in particular with a lunging glove grab from a seated position to nab Carl Hagelin’s shot, he got a bit of help from Kyle Quincey. The defenseman blocked a shot from Ryan Callahan that got behind Howard, and then swept the puck out of danger as the crowd cheered and groaned with 2 1-2 minutes left in the second. Lundqvist made stellar saves against Luke Glendening and Drew Miller midway through the period. "Both Hank and Howard had their `A’ game out there," Rangers coach Alain Vigneault said. "They were seeing the puck and controlling the rebounds. We were just fortunate to finally be able to put one past him." Howard turned aside an in-close chance by Derek Stepan just 3:17 in, and flashed his glove to knock away Brad Richards’ drive 40 seconds later. Howard was then drilled in the mask by Pouliot’s hard shot from the left point. Howard covered up the loose puck and tucked his head down to shake off the effects. Lundqvist held his ground against Olympic teammate Henrik Zetterberg in front during the first of Detroit’s two power plays in the opening period and then made three rapid-fire saves as the Red Wings pushed to score in a final-minute flurry. Detroit finished a 2-3 trip. "You don’t get a lot of moral victories in the NHL," Red Wings coach Mike Babcock said. "To me, the evaluation process for our group is how hard we play and how organized we are. I was pleased with that." NOTES: Lundqvist has given up fewer than three goals in six of his last eight starts. … Detroit was again without veteran forwards Daniel Alfredsson and Pavel Datsyuk. Alfredsson (back spasms) missed his third game, and Datsyuk (lower body) sat out his fifth. … Both teams were 0 for 2 on the power play.